Greetings Fringe Freaks! We're back for another round of Fringe-capping and I know what's on everyone's mind. Many are up in arms about last night's game-changing twist. Many didn't see it coming and they just don't understand it. Yes, Walternate has a lady friend from the orient AND a tiny robe. In all seriousness, I did look at my wife and say "I really hope this isn't the game changing twist everyone is talking about!" Ahh good times, but we'll get into that bizarre scene in a bit. Te twist that actually DID happen is definitely causing much polarization (ahh I miss that word, makes me think of certain LOST episodes) amongst the Fringe fandom. But, let's be honest. Ever since Fauxlivia sunk her paws into Peter we had suspicions that this might happen. AND...September, our favorite observer, made it pretty clear recently too. I know that some people may fear it's too SOAPY but I am standing my ground that I think this is okay. And I know, how is this NOT too soapy for me but Peter having to choose between 2 Olivias to save a universe way too soapy for me? Well, I can't really explain how my mind processes things! It just knows what it likes! And, you all get to read its thoughts on a weekly basis for good, bad or worse! 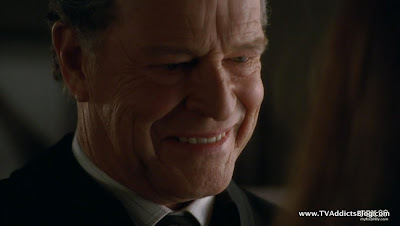 So, on that note let's get into the recap of what I thought was another fantastic episode of Fringe. 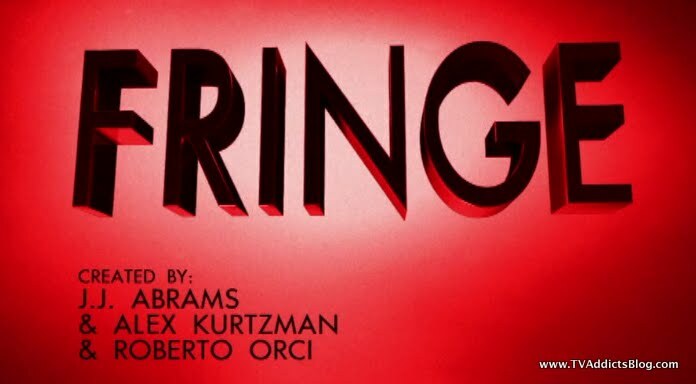 This week's case was more of your typical Fringe fare. Human's being used as guinea pigs for scientific experimentation. But, the difference with this one is that the our scientist villain was actually doing it all for a good cause, if not a little self-centered. 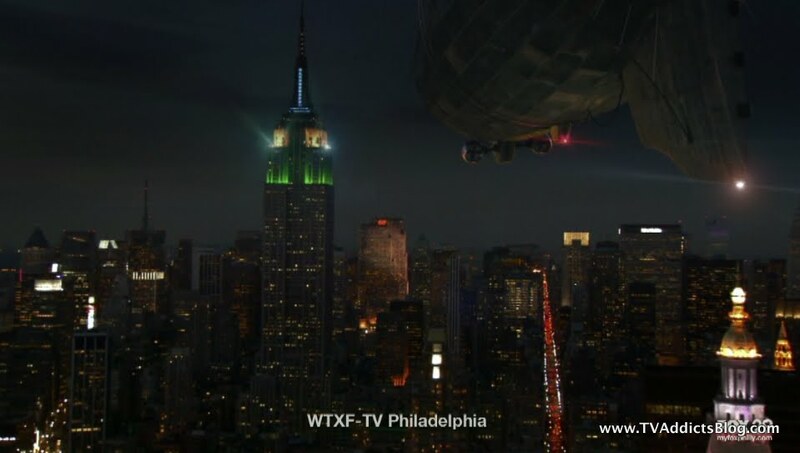 The episode begins with Faulivia waiting for her boyfriend to return from North Texas at the Empire State Building (errr Docking Station, see Observ'er'ations for more info on that). While they are getting reacquainted, Dr Armand Silva was swapping drinks with his first victim to make him a host for some crazy beetles! Long story short, Silva was using humans as hosts because their DNA was as close to sheep as he could get. And these parasitic critters were only known for living in sheep. OVER THERE, there was a Sheep extinction in 2001. Why? Eh, who knows? The Skelter Beetle, I believe, is a made up bug for Fringe purposes. 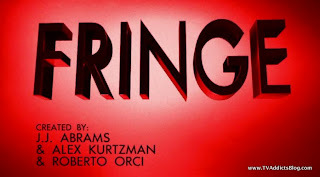 I googled and googled and all I got was Fringe info. But, we cannot let the irony slip past us. "Helter Skelter" is a famous song performed by The BEATles. Get it!?!? 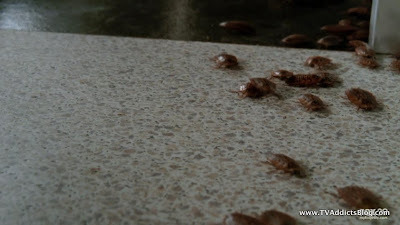 The investigation took all sorts of twists and turns and another victim was found along the way with the bugs getting larger each time. 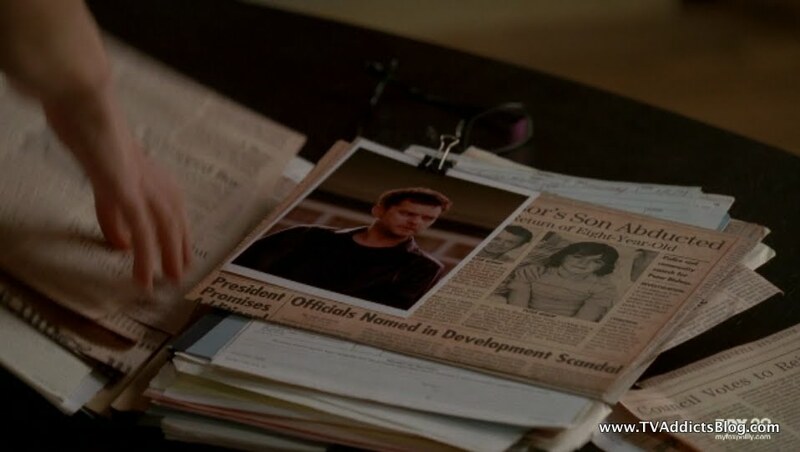 This helped Fauxlivia's man, Frank, figure out what Silva was up to and led Lincoln and Faux hot on the trail. 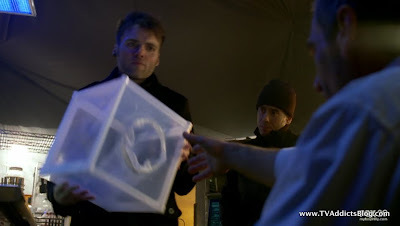 Lincoln gets stuck in some crazy freezer where he uses nitrogen to freeze the door handle and get himself out of there. He was delayed long enough for Fauxlivia to get herself into some trouble! Lots of tension arises as the Fringe Division arrives on the scene with Frank and they think Fauxlivia has minutes to live. They rush her off to the hospital as Lincoln threatens Silva with his gun. 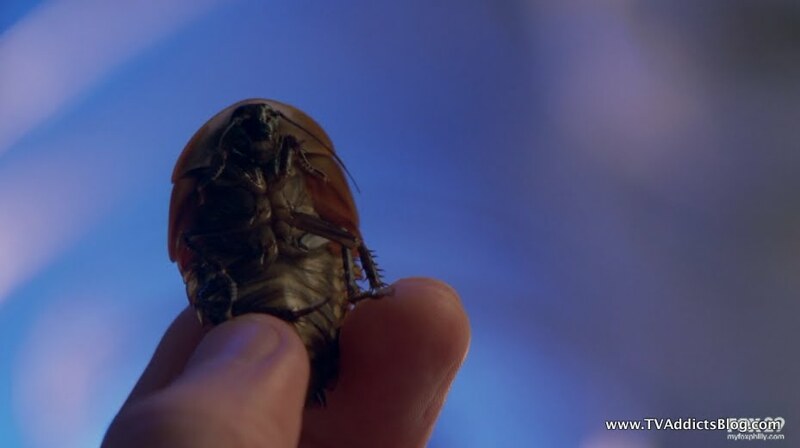 It turns out, though, that Fauxlivia's sickness was something else all together and that Silva made HIMSELF the final host with the ULTIMATE BEETLE BUG that will provide the ultimate cure. Silva's dying wish is that he wants Lincoln to make sure they spell his name right. Ironically, IMDB has the guy listed as Anton Silva when he clearly says Armand in the episode! 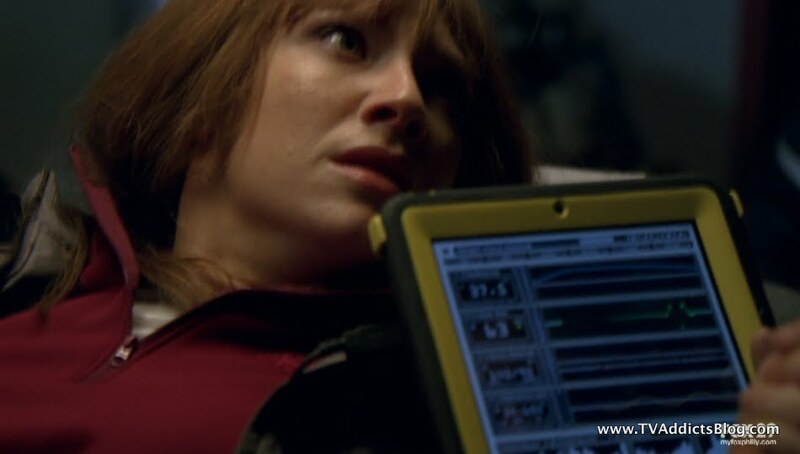 So what happened to Fauxlivia? Oh, don't you worry. We'll get there! Quite a few different progressions here throughout the episode. So, let's get to it. I must have forgotten the fact that there may be 2 versions of this Doomsday Machine, one in each universe. That missing piece we were talking about last week is the piece that Fauxlivia recovered in one of her first cases in our world. It has been finally shipped over to Walternate. And AlternaBrandon says the piece will be integrated into the machine soon. Either there are 2 machines, or they're going to integrate it in the machine OVER HERE. Brandonite has been doing some additional research into the extra chemicals found in our Olivia's brain. He has developed a breakthrough on the chemical, or what we know as cortexiphan. They injected it into a young man and he developed telekinetic powers. Well, maybe it was really his midi-chlorian rate was increased 100 fold because that boy was using THE FORCE!! Anyway, it was not determinable if this subject died, but the other 9 subjects they tried the injections on died in 30 minutes. 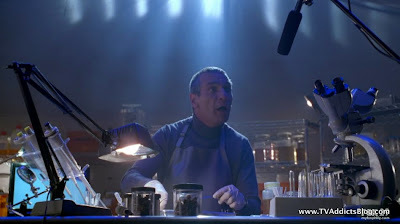 You have to love Brandon delivering the line "We'll know more after we dissect his brain, but I have a theory." Ouch. 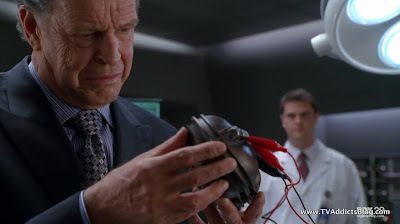 It must be a common thought with both Walters that the human brain is infinitely capable at birth, so Brandon's first thought is to experiment with children (like Walter and Bell did). Walternate wants NO PART in this. It probably has something to do with what happened to his son as a child, but this may be showing us the first GOOD side of Walternate in favor of one of Walter's BAD sides. Walter and Bell experimented on children so that they would protect us all in the future. But, any way you slice it they were still meddling with these children, who we still see are having problems today (like Simon last week). Walternate has a zero tolerance policy on child experimentation. And that brings us to his big moment where he is confessing the weight of the world's problems that are on his mind to his MISTRESS!!?!?!?!! Who was this woman, Reiko? I do not remember any indications that Walternate and Peter's mother were separated. 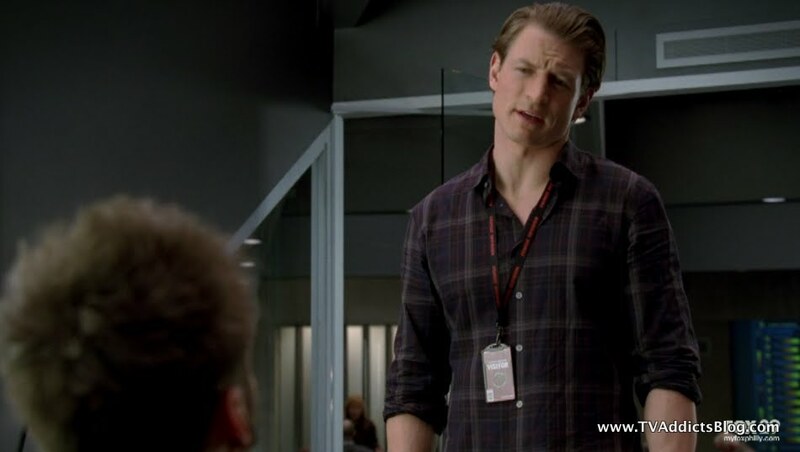 In the season 2 finale, Peter was talking with his mother and she didn't seem to indicate anything like that. And where did they dig up this actress?! I'm not saying I'd set the world on fire with my skills, but come on! This whole scene was laughable especially with Walternate wearing that robe! But the content of the scene seemed pretty important. Walternate wants Peter back. He didn't factor in Peter's feelings for the people he'd be leaving behind. His attachments. He didn't consider Olivia. But Reiko is convinced he'll find a way to get Peter back. So Lincoln is the new head cheese over at Fringe Division. Looks like it started off as a temporary assignment as they searched for AlternaBroyles, but they stopped looking. For those who do not remember, this Broyles assisted OLIVIA in her escape back to our world. Olivia helped Broyles' son and promised she'd save both universes. Walternate had Broyles chopped up to the same size/mass as Fauxlivia to do a Universe Exchange and extract Fauxlivia back to this world. Anyway, Charlie seems to have a little bit of a grudge with Lincoln getting the nod but it seems to be all in good fun. Charlie may have his hands full anyway with BUG LADY! Faux and Charlie met Mona Foster while investigating the Skelter Beetle. Apparently, when this Charlie got a case of the arachnid infestation, Mona was there to save his life. She loves the fact that he has spiders in his blood stream. Mona: How are the spiders? Mona: Maybe you just need someone to scratch it. Is it hot in here or whaaat??? If everyone recalls, OUR Charlie had a case of Larvae over here and Walter was able to cure him. This is a little different than spiders, but same flavor, right? And then there's AlternAstrid. She is one weird lady! Shouting out crazy statistics again. She insisted they put out a warning about these Skelter Beetles, which does happen but she also said statistics prove they'll get 2 phone calls. Yeah, they got 200 crazies calling in about every spider under the sun! Our Astrid definitely would take down this Astrid! Then there's Fauxlivia. The whole episode she doesn't seem too thrilled that Frank is coming back into her life. Yes, she puts the smile on and they joke around with each other. But, even Frank notices she's being a little off and she also has pictures of Peter lying around on coffee tables. Well, one crazy twist is upon us but we'll get there in a second. Notice the water she's drinking. Did she already know? First, let's talk about how Frank and Fauxlivia met. There was a cholera outbreak in Hoboken, New Jersey. 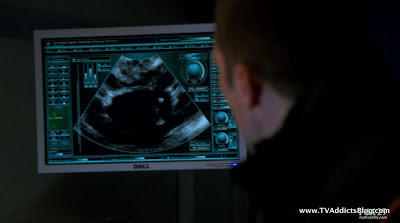 Frank must have worked with Fringe Division just like he was with this case and the two of them met and fell in love. Frank wants to get away for a weekend with Faux and asks Lincoln if she could be excused once the case is over. 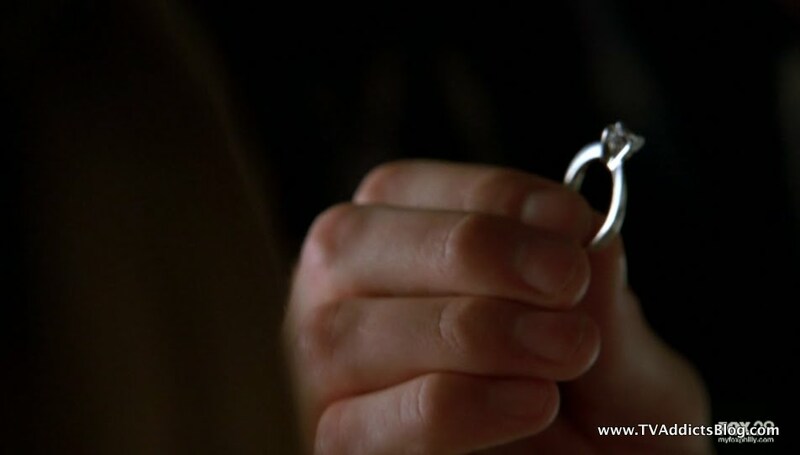 He also confides in Lincoln that he's going to propose to her, which Lincoln directly goes and tells Fauxlivia. The Worst Proposal Ever follows when he does the ol' Don't forget your Keys AND.......THIS! She smiles and says yes and tries to convince herself she's happy, but we know she isn't. No Fear, that infestation of bugs we thought she had, it wasn't. On the way to the hospital, Frank is about to inject her with some kind of something to fight the bugs. 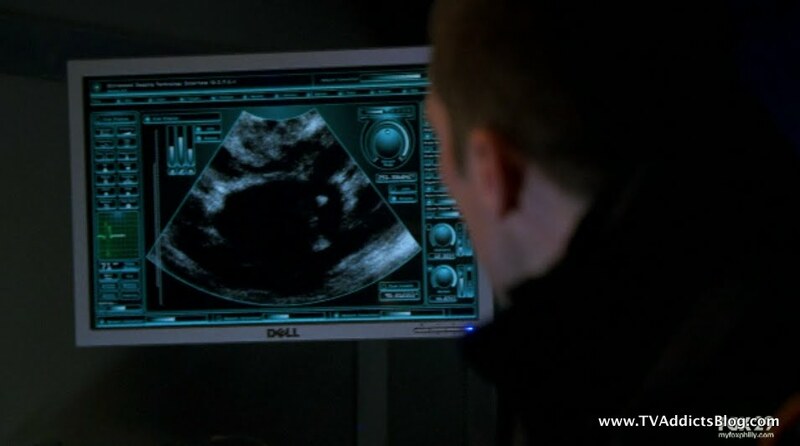 Maybe most Fringe fans were hoping that he did it anyway because instead they ran an Ultrasound and something popped up on that screen. Yes folks, what you feared is true. What September told Peter about is true. And so goes the sands of time and the days of our lives as the world turns we only have one life to live! Fauxlivia admits in silence that she still loves Peter to Frank and Frank leaves her and moves out quicker than you can say ALTERNATE UNIVERSE! Walternate is a proud Gramps and he thinks he found a way to get Peter back and to CHOOSE THE RIGHT OLIVIA. 2 words, CALM DOWN! It's just ONE plot element everyone! I'm overreacting based on what I've seen on twitter and the complaints being shouted in my ear by the Mrs. 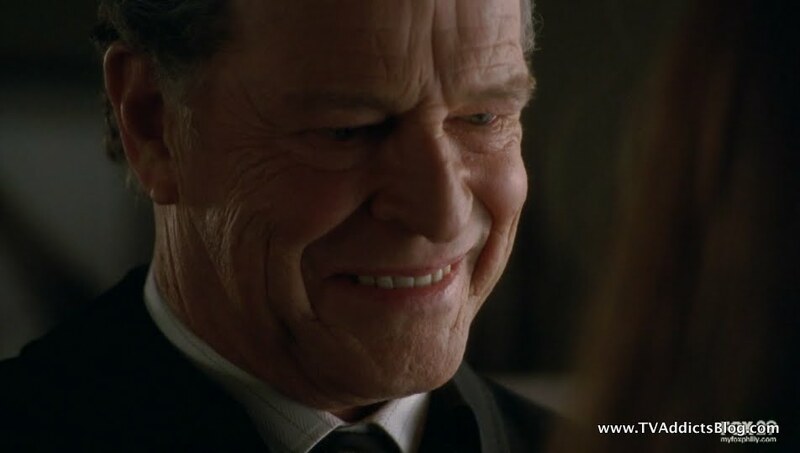 This is not a night-time soap opera, this is FRINGE! But every show needs to add a little dramatic twist now and then, right? What is more exciting than Peter impregnating the Alternate Universe version of the woman he wants to love with the fate of 2 universes at stake? Okay, even I know it sounds a bit cheesy and crazy, but I really do think Peter falling for 2 different versions of Olivia is a great direction to take the show. 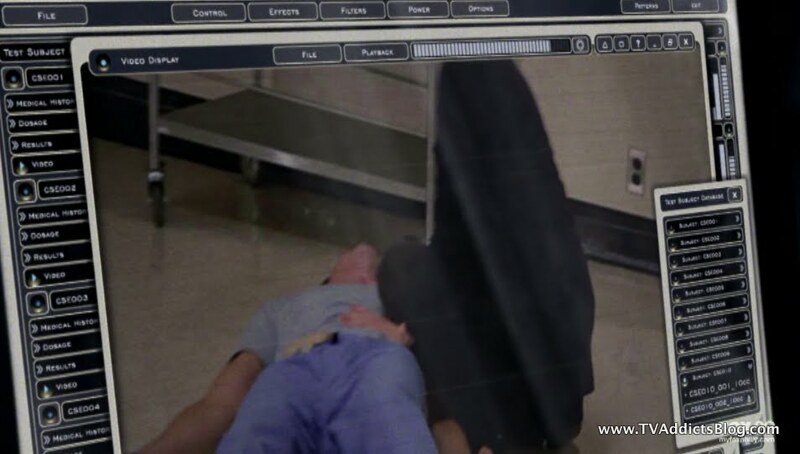 One of the Olivia's being pregnant? That's just icing on the cake. That doesn't mean it's a shoo in that Peter is going to go back to Fauxlivia and destroy our world. 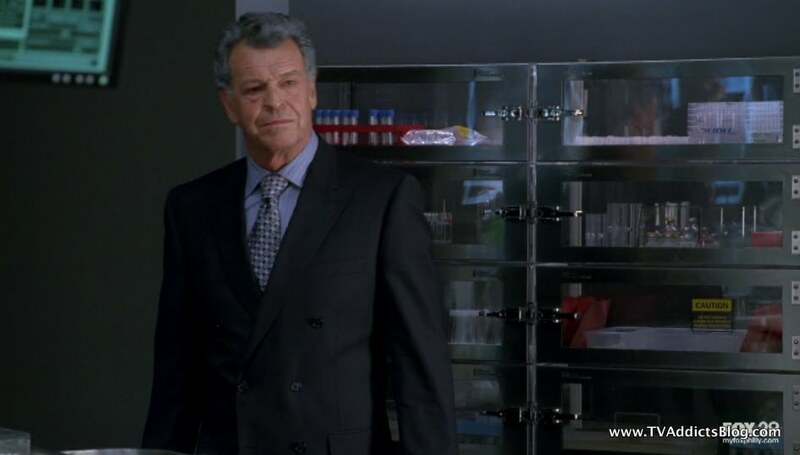 This is FRINGE. Things aren't going to be THAT simple. Even the producers reached out to calm fans down saying that this will not be a traditional story. I still think OPTION C is going to happen when the machine(s) is/are activated. It's not going to destroy world 1 or world 2 but possibly create world 3 (or...possibly even merge worlds together maybe?) Yes, I read the Doc Jensen interview with Joshua Jackson and they seem to be hoping for something similar as well. There is more to this story than just Fauxlivia being pregnant. The show is not ruined. It just has added a nice dramatic element to drive the plot into new and exciting directions. So let's stay CALM and get to some fun stuff! Observer Spotted: He's hanging out at the top of the Empire State Building while Fauxlivia is waiting for her man to get off of the airship. 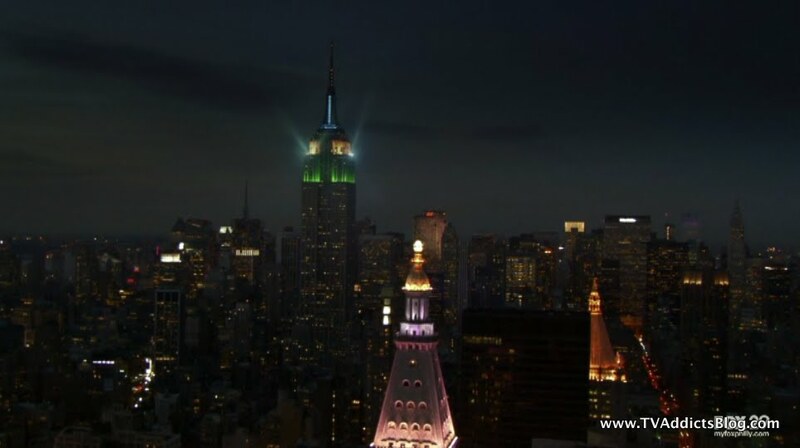 Empire State Building is actually the Empire Docking Station. I believe we first caught site of the building being used for this purpose in the season 2 finale "Over There". This made us do some investigation into the fact that the original intention of the Empire State Building was to be an Airship Mooring. Crazy, right? Silva listed off names of famous scientists that did something with their lives. Jonah Salk was brought up as the man that CURED Polio. Not sure if it's just a technicality but our Jonah Salk merely came up with a vaccine to fight Polio not completely cure it. As for Watson and Crick, they're the "DNA GUYS" in both worlds. While Faux and Frank were talking in their apartment, we heard a different rendition of Cheap Trick's "I Want You to Want Me". Not sure if they were suggesting it was a success for someone else in this universe or if they were just playing a cover of the song. Hey, we know U2 doesn't exist OVER THERE, so maybe different people perform same songs too! The Skelter Beetle Warning asked people to dial 711 with information. Was that in place of 911? Well that's it folks. Not good news on the ratings front. As I was writing this the numbers came in and it dropped again, big time. 3.7 million viewers last night. OUCH! I'm sure the DVR numbers will even it out but we need more eyes glued to their sets on FRIDAYS! Hey, I was at a party last night and excused myself for an hour to watch TV in their basement. DEDICATION PEOPLE! Anyway, we can only hope the show has done enough to get itself a 4th season. But we'll just have to wait and see. I'm still on board with the show and can't wait to see what is next. Hope you enjoyed my ramblings and I'll see you next week!! Shows I'm watching right now (and might comment on time permitting): Episodes, Shameless (both Showtime), Chuck, How I Met Your Mother, V, Modern Family, Cougar Town, Friday Night Lights (I don't have DirectTV so don't tell anyone how! ), Big Bang Theory, The Office, Community, 30 Rock, Smallville and others that I won't mention out of embarrassment! Upcoming shows I'm looking forward to: Game of Thrones (HBO), Terra Nova (FOX - Pilot airs in May but show begins in fall), Breaking Bad (AMC), Several JJ Abrams shows launching in the fall (Alcatraz with Jorge Garcia, Odd Jobs with Michael Emerson and Terry O'Quinn to name a couple) Note: looks like Odd Jobs got moved a year out. Not happy! 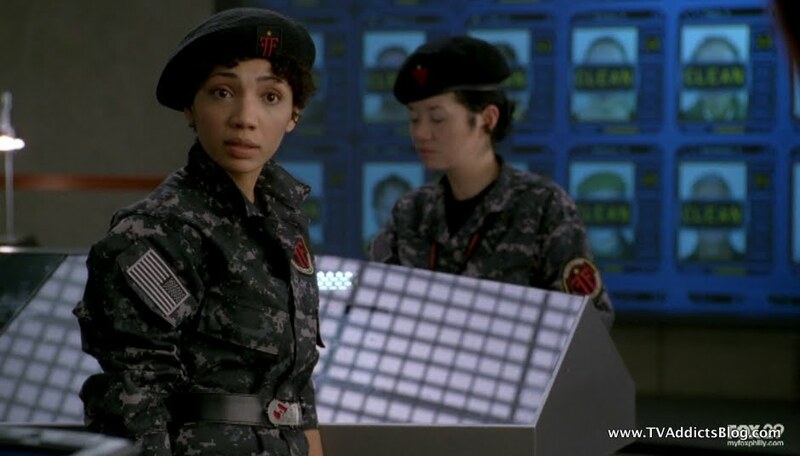 Joan Chen played Walternate's girlfriend. While I didn't see anything exceptional about her performance here, she is a well established actor of many years. I don't think they had to dig her up. She was on 'Twin Peaks' years ago and 'Fringe' has referenced 'Twin Peaks' before. Maybe that's why they used her? Thanks for the information Anonymous! I'm sure her Twin Peaks cred helped her land the role. I, myself, never watched Twin Peaks but I do acknowledge its significance in being the show that inspired shows such as LOST, X-Files and Fringe to follow! But, I still cannot fathom where they are going with this storyline...because I'm pretty sure Walternate is still married! Were we supposed to pick up on that? Who knows? Id love to be one of the ones to make sure I stay tuned right on Fridays instead of DVRing it and watching it on the weekend/Mondays..but I'm just too busy watching Dancing with the Stars, American Idol, General Hospital, and all the other affeminate shows that I have on my TV Watching schedule..they are just too similar to the drama I am dealing with week in and week out with Fringe for me to make that distinction.. Remember when JJ Abrams just made Felicity? 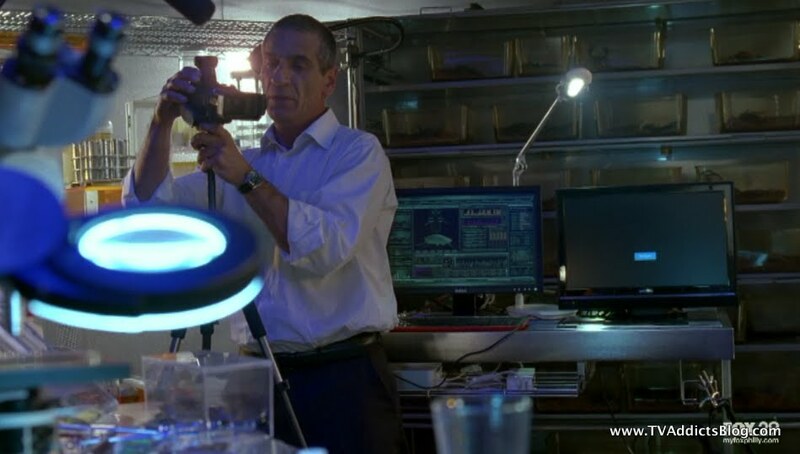 well it seems like he is back to that type of writing/creating..
For starters AUSW, I hardly think JJ Abrams is involved in the day in/day out decisions being made on Fringe, similar to his involvement with LOST after the creation. This is all Jeff Pinkner and JH Wyman. So if you have beefs, point it in the right direction! :-) But, I've already stated my piece on how I think this plot advancement is an entertaining one that will bring some good drama and not TOO soapy. I still think the basic idea of Peter having to choose between Olivia's to save a Universe is a little more ridiculous still. I'm still invested so let's see where they go with it! 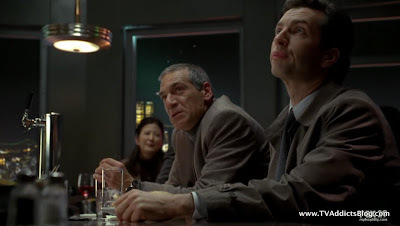 its specifically the difference between a show like The Walking Dead and the current storylines on Fringe...TWD focuses on the survival of one group and isnt twisting it into "omg this group must survive because they are the key to saving the world" because they have some vaccine in their blood or something..know what i mean? "I agree...i don't like that the characters have elevated importance so I'm with you there. But the fact that Faux-livia is pregnant, I like as a dramatic twist on the story for these characters. I want an explanation though to why Peter himself is so important. I know what you mean with TWD....and those 6 episodes were fantastic. But I'm sure they may become more important as the story goes along. Just like the the CANDIDATES became important in LOST when starting as just a survival story. And yes...the comics just keep going with no end....but Frank Darabount already said they need to work on an end game for TWD and a logical building and concluding story. But I know exactly what you mean. I won't say the show jumped the shark though...I think they are having a spectactular season still...but I wouldn't mind them tweaking a few things. I have someone coming over to my desk but I'll probably copy and paste this response on there eventually lol "
You and Austarwars are too funny ! I was intrigued by Walternate refusing to experiment on children while our Walter had no qualms about that. Veeery interesting. Guess it was just me but I didn't notice or care about the robe, and didn't think it was tiny. But throwing in this chick seemed pretty pointless. Either she delivers her lines very badly or she has some agenda that Walternate does not know about though - cause she seemed fake as hell. True thought that the actress had been in many things and is considered a good actress. Loved Charlie being infested in both sides ! LOL And Lincoln was hysterical with his secret keeping - or lack thereof. Walternate nowing about her pregnancy was creepy though ! Holy Hipaa ! 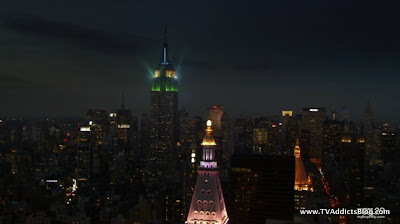 I always knew the ESB was to be a zeppelin docking station in real life. Sorry I never thought to mention that. Could have saved you some research. I want you to want me was just awful - and very funny. Personally - I hate bugs. i can watch amputation and gore galore on tv and movies - but dont' show me bugs. So was looking away alot this ep. I am not liking the whole baby thing, but I don't think it's the ruination of the show. At least not yet. It def is soapy - and been there done that - but I think fringe will eventyally put their own spin on it. I have faith in them. I still don't like that Peter's libido will determine which universe survives. j/k ! Know it won't be that simplistic. Agree about Event - but I'll watch again when it comes back. Am watching V but I think they have effectively killed that one too. 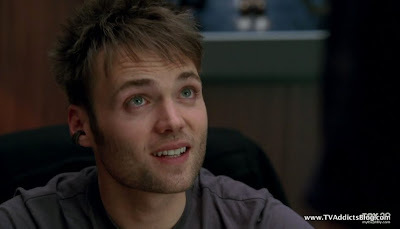 Chuck was great this week ! CAT Squad indeed ! Was a good time though. Loved the Predator reference in HIMYM too ! @MJ - Okay - Here we go! Fringe: Yep, the humanizing of Walternate in direct contrast to something Walter had no issues with is very interesting. I don't think I would have noticed the robe either, but my wife brought up that it was pretty small so that snowballed into us laughing at the whole scene! Interesting angle that maybe she was hiding something from Walternate. It could be that or hey...we can't discount that the writers/direction provided the wooden dialogue. It has been proven that the actors in the Prequel Trilogy of Star Wars are very capable actors (See Natalie Portman who will probably win an Oscar this year), but there's not much that can be done if the script isn't very good and the director cares more about creating digital creatures than providing direction to humans! Anyway, I'm sure this is not the last we've seen of Reiko so maybe it will get better! Charlie and Lincoln stuff was great. I'm glad that they made the OVER THERE characters likable and not necessarily THE ENEMY. 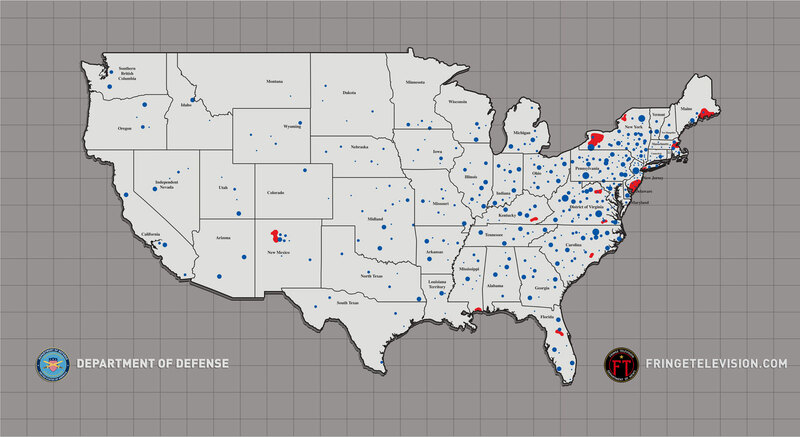 Still interesting in finding about about OVER HERE Lincoln. Yeah, bug stuff is usually a head turner for me too. Then again, sometimes gore galore gets to me too! I definitely still have a bigger issue with Peter's Libido saving the world than with Fauxlivia being preggers. I think they will take both of these storylines in satisfying directions but I still think the preggers thing was a good twist even at face value. I like drama with my drama! CHUCK: Yep, doesn't take much for me to love an episode of CHUCK. Loved the CAT Squad also. Loved Morgan turning down Karina repeatedly for Alex. Ahh good times. Episodes was a good time again. I can't believe it's only a 7 episode season. Next week is the finale! Another solid outing for Shameless too. That is a 12 episode season. For real ? Episodes is only 7 long ? I'm a little crushed! I haven't watched from this weekend yet. Interview with Pinkner & Wyman. A little spoilery - but more hinty. And I'm loving the hints ! Agree with them - the relationship that Fauxlivia, Charlie and Lincoln is highly enjoyable - my fave part of over there. 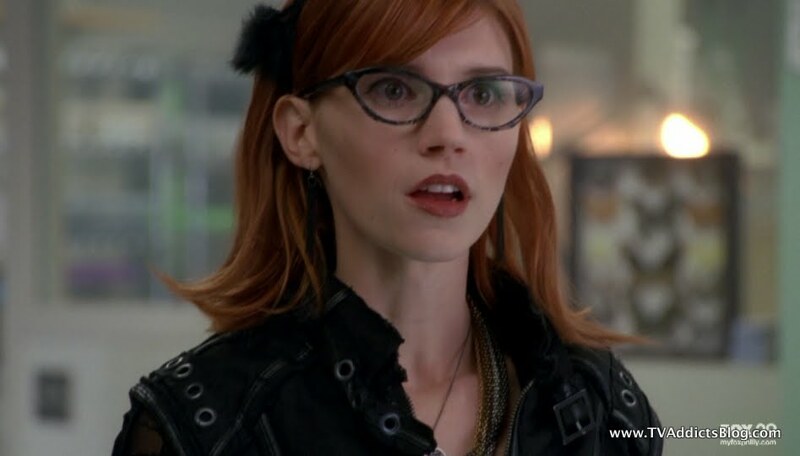 And, dare I say it, I'm actually liking fauxlivia more than our Olivia ! Always felt like our Olivia was so stiff - never enjoying life. I'm not saying I want Peter to choose 'over there' but I like them all a little better - except Walter and Astrid of course. Thanks for the link MJ! That's a very good interview with them. I love the layered approach and that they're already mapping out season 5. I'm watching season 1 now, so I'll be able to validate if any of this stuff ties in. Though, I think I already watched the bus episode and didn't even consider the amber lol Very excited that they think they have some big surprises in store for us. I wonder if they've already pitched this stuff to Kevin Reilly (Fox prez) and that's why he's confident Fringe will be sticking around!? I agree though - it's tough to admit it but Fauxlivia is a little more likable than Olivia lol....but Olivia kinda points out why a couple episodes ago. That red wig has got to go though! And Charlie/Lincoln and Fauxliv do make a great time. It would be interesting if this machine somehow MERGED the 2 universes but I wonder how that would work out? Because that's the problem...i wouldn't want to do just have the Alt Verse in the end...because of Walter. The show is not FRINGE without our Walter. So it's going to be very interesting where they go with all of this. Can't wait! Unfortunately, I'm going to have to wait a LITTLE bit. Some family obligations and social outings will interfere with me watching Fringe tonight. but it could be all for the best...I have a new TV coming tomorrow and it's going to be AWESOME....maybe I'll break it in with a little FRINGE viewing!! I'm off Monday, so I have plenty of time to write this blog over the holiday wknd!